sen monorom, Mondolkiri pro­vince – Negotiations between ethnic Banong villagers and local authorities broke down Tuesday with lo­cals walking away from the talks, saying they were too weighted in favor of the Khaou Chuly company taking their farmland to establish a massive rubber plantation, participants said. About 200 people attended the hour-long meeting at the Busra commune office in Peach Chreada district in which took part by a Khaou Chuly company representative, provincial and district authorities, commune councilors, village chiefs and NGO workers. At issue is 2,705 hectares of land in Busra commune that the government awarded in 2007 for the Khaou Chuly Group to turn into a large-scale rubber plantation. Some 1,030 Banong families from seven villages say the land is theirs because they have been using it for traditional rotational farming for decades, and they have legal ownership under the 2001 Land Law, which protects indigenous people’s property rights. The Khaou Chuly company star­ted clearing portions of the forest in April, and a large rubber tree nursery is already in operation. About 400 villagers who oppose the clearance of their forest rallied Saturday and set fire to three of the com­pany’s excavators and damaged a fourth using axes and machetes. 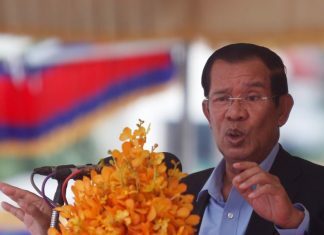 Tuesday’s talks made little pro­gress, said Em Veasna, an investigator for the human rights group Vigilance of Cambodia who attended the meeting. The Banong villagers were angry and the government officials appeared to be defending the Khaou Chuly company, Em Veas­na said, adding that the meeting was not helped by the strange ap­pearance of a wild deer. The deer, who appeared from no­where and ran through the crowd that had gathered for the talks, was collectively viewed as an omen, though participants could not agree on whether the animal’s presence was a good or bad sign. Provincial Deputy Governor Yim Lux said Tuesday that both sides were to blame for the dangerous escalation in the dispute. “Both the company and villagers are in the wrong,” Yim Lux said. “The company’s mistake is that they are slow to resolve the matter [of compensation]. And the villagers’ wrongdoing is burning the excavators,” he said. “If the company and local authorities try their best to resolve the matter as fast as they can, I think the villagers would not express their anger by burning down the excavator,” he said. The villagers, Yim Lux said, would eventually benefit from jobs, and new hospitals, schools and houses for rubber workers. One Banong woman said the talks were pointless. “Our villagers just walked away from the meeting because the meeting was organized by this provincial deputy governor who is just biased to the company because he just wants us to compromise and accept the three choices that we already talked about with the company,” she said. “I will not sell the land or accept any offer from the company anymore. I just want my land back,” said the woman who requested an­on­ymity for fear of being targeted following Saturday violence. “If local and provincial authorities intend to improve the living standard of my people, they should come and talk to us at the village before they send their equipment and clear our farmland,” she added. NGO Forum Executive Director Sam Ath appealed for calm Tues­day, and for the government to in­vestigate the social and environmental impact of the Khaou Chuly plantation. Yim Lux said later Tuesday that he would hold talks with the villagers again today, but their pro­tests are futile. 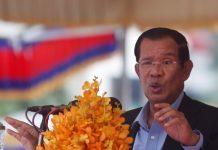 “We cannot stop the company because the government has already granted an economic land concession for Khaou Chuly group and furthermore, the company has already planted the rubber nursery,” he said. According to Yim Lux, the company only ac­cepts that there are 72 affected families who farm 95 hectares of the disputed land. 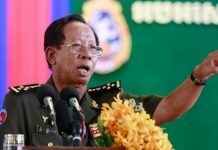 Thirty police officers and soldiers are now deployed to protect the rubber plantation, its nursery and equipment, he added.